Our final southern California college on the tour was Biola University. We had the most extensive visit at this school with a couple of conferences, a tour and a free lunch in the dining hall. (Now that'll go a long way with a Dutchman!) The school is similar in size to Azusa Pacific and the student body seemed very similar. Biola is more blatant about it's christian emphasis and requires all students to minor in Bible. Of interest to Calvin was a cultural linguistics program and a unique honors program that has a separate track of tutor style classes which fulfills all the core Bible and Humanities requirements. By the this time we were all about 'toured out', so we decided to do some sightseeing. 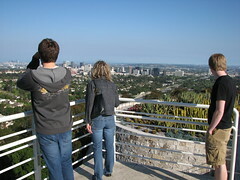 We headed up to the Getty Center with its beautiful architecture, museums and gardens, all overlooking the valley. Wow! what a view. Fortunately, it was a clear day and we could see the whole valley. The museum and grounds are free of charge except for the parking. We all enjoyed the experience, though our legs were tired from being on our feet all day. Tonight we are in Bakersfield ready for our next adventure tomorrow.